Patrolling the Lower Niagara River and Lake Ontario Waters. 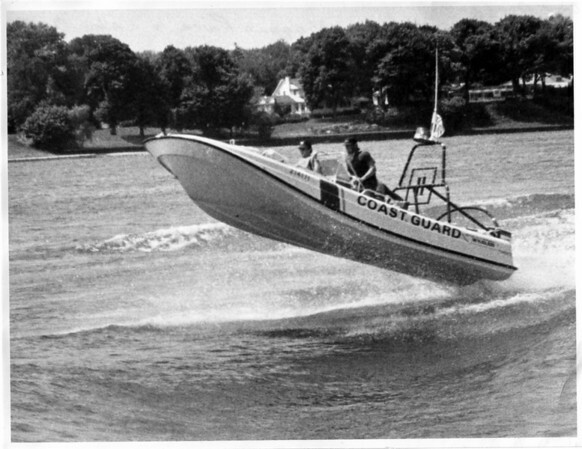 U.S. Coast Guard 21 foot search and rescue launch - with 70 horse power motor. The picture shows the boat crossing a 4 foot wake. From left to right - Boatswains mate 3rd class Dan Walther and Boatswains mate 3rd class Sergio Cardenas - at comtrol wheel. Photo - By Andrew J. Susty - June 1979.